Among the innumerable online security companies, F-Secure have managed to stand out and offer a pretty decent option for everyone around. This is what has urged us to take up the challenge of a thorough review, which leaves nothing to chance. In this article, we will check out both their advantages and disadvantages as a company aiming at online protection and we will proceed with our honest verdict. Join us and learn more about the overall effectiveness and evaluation of this security software. After all, we are always in search of improving even the most reliable tool and this is what has brought mankind to this point of remarkable progress! As you know, the field of online protection includes a lot of worthy competitors and they are all trying to make a difference through their software and additional products for sale. F-Secure make no exception to this rule. With state-of-the-art features and with the most advanced technology, IT experts do their best to figure out which the best features for online protection are going to be in each case and for each device. One of the downsides that we have found out during our F-Secure review is that there is no actual listing of these features upon purchase of your software. So, you pretty much have to figure them out on your own as you go. The installation of F-Secure is really easy and simple to complete. You follow the guidelines and there is not even a requirement on your behalf to erase all prior online protection software. On the contrary, the software deletes everything before being installed and ready to use. So, even if you have forgot something on your computer that conflicts with F-Secure, the latter will track it down and delete it automatically. As for the interface, it is truly innovative and easy to comprehend. This can be lacking the challenge that some tech savvies crave for, but it is a great tool that literally everyone can use without any problem or difficulty whatsoever. You navigate the functions and different sections of the online protection software like a breeze and you handle all the options without fail. Whereas their interface and setting up process are straightforward and simple to grasp, price rates cannot claim the same. Instead, there are numerous variations that you have to look through for getting the actual subscription that covers your own needs. 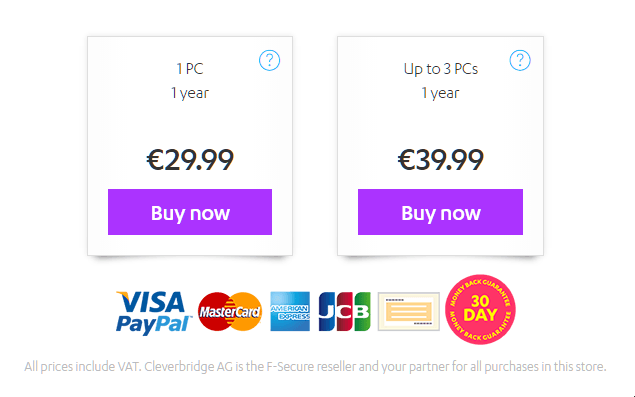 Good news is that you can get protection for up to 3 computers at $39.99 for a whole year or $66.99 for two years. Still, the price goes up for mobile devices; you ought to pay $49.99 for one device, $69.99 for 3 devices and finally $89.99 for five devices. As you can see, things can get complicated and costly, to some extent. Fortunately, there is a 30 day full money refund guarantee and F-Secure accept multiple payment methods (including credit and debit cards, PayPal and UCB etc.). This is definitely the sector where F-Secure thrives the most! There are various different methods for you to contact the tech support of the company, such as a live chat or the submission of support request with your personal info. Of course, there are also updated downloads and a helpful community that meet all kinds of needs in the field of installation and usage of all F-Secure products. What is truly amazing is the fact that they encourage you to take snapshots and upload them for the tech support to have a look and diagnose the problem more efficiently. Overall, there is nothing lacking, as far as online protection is concerned. As you can see from their official website, F-Secure have received awards for excellence in the field of online protection by unbiased testing labs, such as AV-Comparatives. They have been ranking really awesomely regarding anti-spyware and adware protection, with the sole exception of phishing. This does not mean that they do not offer anti-phishing protection, but they used to have deficiency against this severe problem and they currently offer basic protection. Other than that, web protection in real time is thorough and does not slow your device down. There is the option of placing a strict firewall that provides solid security and unique benefits to your overall protection. All in all, the protection offered by F-Security is supreme and trustworthy. 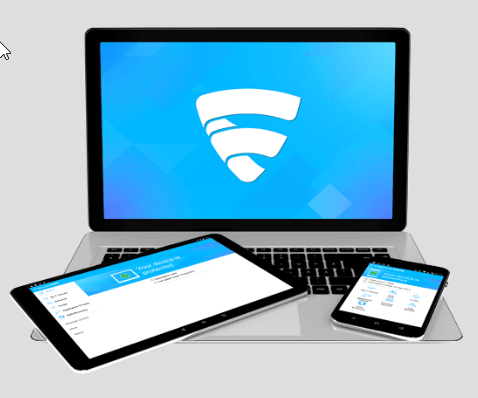 F-Secure have got solutions fitting the needs of everyone using the web. This means that you can download the specific software that is suitable for Windows or Mac, Androids or Apple devices and tablets of all sorts. That being said, it is worth repeating the variations in the price that come with the selection of numerous devices. So, according to your needs and based on the number and type of devices you are planning to make use of F-Secure, you can choose the perfect solution and respective download. F-Secure can offer thorough protection to mobile users. With the Freedome solution, you can get everything you need for your phone’s privacy and security. You can track it down and indulge in VPN facilities, get alerts when phishing occurs and generally tasting what Freedom is all about with your mobile device. Additionally, there is the F-Secure App Permissions option; this is a free app that can alert you on high risk and potentially threatening apps that you are ready to download. Mobile Security is an extra app that is only available on Google Play store. All these apps and conveniences show that F-Secure have set the bar pretty high in mobile protection (at some times with an extra fee). F-Secure is a reliable option in the field of online protection, with solid performance and unique benefits regarding mobile users. Though their fees could be a bit more affordable in cases of multiple devices, their tech support makes amends and provides exceptional services to the subscribers. It is easy to set up and use, making it a great alternative for newbies and people who are not that tech literate. It is worth trying out, at least for the complimentary month offered! F-Secure is certainly a tool that will not fail you in your effort to make the most out of your online protection. Although there is no direct feature against phishing and the interface can be disappointing for tech savvies with high demands, it is a great performing option for people who want to get simplicity and unique results. Despite the cost variations for devices, the support is top notch!